Is a Federal Carbon Tax coming to the USA? The answer can be surmised in one point: Exxon has been lobbying Congress to institute carbon regulation. This corporate policy became public after a 2009 speech by their CEO, Rex Tillerson. Recently, Judges from Minnesota and Washington have lent credence to the public costs (health and pollution) of burning fossil fuel. While California’s cap and trade program flounders, critics are calling for a simpler, direct carbon tax. 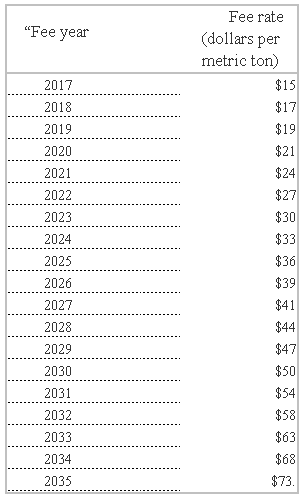 And in December of 2015 a bill was introduced in Congress which laid out clear carbon tax pricing through 2035. That bill, S.2399 – Climate Protection and Justice Act of 2015, is stuck in committee. As our consciousness of climate change transforms into new policies, two important questions emerge: What form of carbon tax will most effectively meet our goals of long term species sustainability and why is Exxon advocating a certain version? This title aligned with a comment from Koch Industries’ top lobbyist, Philip Ellender, “A carbon tax would make energy more expensive and in turn raise the costs of consumer products and services on which people depend.” While Exxon purports to advocate for a carbon tax, decades of lobbying against climate science have raised some red flags. 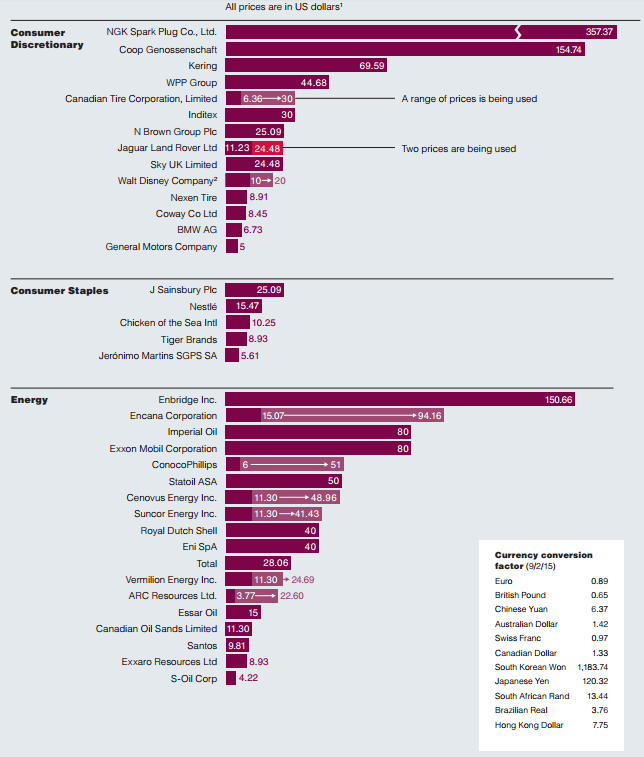 Exxon has long factored some form of a shadow carbon price into its manufacturing and exploration costs. This number has risen to $80/ton in some areas. Some scientists believe the cost should be greater than $200/ton today. 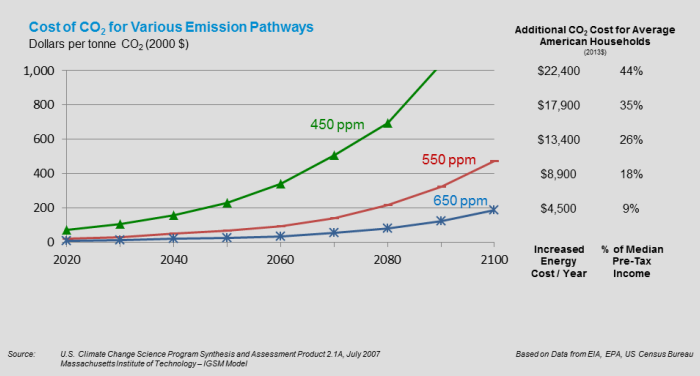 It is highly likely to cost more than $200/ton to keep the planet’s CO2 levels under 450ppm in 2050 according to even document published by Exxon (see above). We’re currently averaging greater than 400 ppm and peaking greater than 408 ppm. 350 ppm of carbon dioxide is what much science says will stabilize our atmosphere in patterns similar to what civilization developed in. Of course, Exxon is not the only company to have considered how the price of carbon in their business processes will affect their bottom line. Formerly known as the ‘Carbon Disclosure Project‘, the UK based CDP collaborates with 435 major corporations to disclose their greenhouse gas emissions. The companies range from toolmaker Stanley Black & Decker to the Brazilian mining company Vale. The evidence in British Columbia supports a carbon tax. Fuel consumption in BC is down 16% (2008-2014) while overall Canadian fuel use rose 3%. Revenue-neutral carbon tax law means every dollar paid in carbon taxes is deducted from income (or other) taxes. BC is now home to the lowest personal income tax rate in Canada, and a corporate tax rate ranking among the best in North America. Economists (some with caveats), Exxon, and Elon Musk have all expressed that a specific version of the carbon tax – revenue neutral – is the best way to push consumers toward cleaner purchasing habits without hurting the broader economy. Musk astutely compared CO2 emissions to garbage collection. We happily pay to remove garbage to mitigate the damage that it does do to society. Greenhouse gases are certainly a type of garbage. Conversely, garbage releases a lot of greenhouse gas, so this metaphor will probably keep working even if you’re easily confused. And now we reach the real question – why would Exxon support a carbon tax publicly (even while financially supporting those who vote and campaign against it)? Public Relations: The simplest idea is that Exxon wants good PR. With 56% of Republicans stating that they believe the climate is warming, (up from 40% just five years ago), Exxon and every other company will need to be conscious of their greenhouse gas production. 74% of Millennials say that sustainability is a shopping priority. 51% of the global population believes that climate change is already harming people – this number will only increase. Many companies this author works with report that they’re having to refine their business practices and communicate these practices to the general public to keep business growth consistent. RICO Investigation: When the tobacco industry was fined many billions of dollars, it was for the crime of organizing as a group (RICO) to mislead the public on the health consequences of smoking cigarettes. Once it became common knowledge that cigarettes were bad for your health, those who made the choice to continue smoking were to bear their own consequences – but before a certain time, misdoubt had been strategically distributed and the tobacco companies were liable. A similar logic has arisen with fossil fuels. If you choose to buy a car that runs on gasoline or a hospital on natural gas, it is not the fault of an energy company for providing a fundamentally important product – but to have your technology choices limited due to a global misinformation campaign is a crime. We now have proof that Exxon paid third parties to manipulate public perception of fossil fuel’s effect on the climate, while having known for 40 years that climate change was real and caused by fossil fuels. A large number of State Attorney Generals are binding together to investigate Exxon on these charges. One motive for Exxon’s preemptive defense against future litigation is clear. Product Type: Exxon makes significant amounts of profits from the sales of natural gas. Natural gas is a direct competitor with coal, a product that Exxon has no interest in. According the the EIA, natural gas generates 41% less CO2 for each kWh of electricity produced compared to coal. A carbon tax of $80/ton will add $.08/kWh to a single kWh of coal-generated electricity versus $0.03/kWh for a similar volume of natural gas electricity. The long-term financial viability of the struggling coal industry is already questionable – adding $0.08/kWh to your electricity bills will end that viability. Exxon’s hundreds of billions of dollars of investments in natural gas would remain profitable at their current all-time low prices. Avoiding the real cost: The IMF calculates that fossil fuels are receiving $5.3 TRILLION in subsidies and ignored externalities (direct and indirect support) every single year. Researchers believe air pollution as a result of burning fossil fuels leads to greater than 5.5 million deaths per year. Estimates of the potential costs of unmitigated climate change are 20% of the global economy by 2100 – every year. No industry can pay all of these costs – let alone a single company – but by shaping the policy debate Exxon can push the responsibility elsewhere for longer. Control: If you are not at the negotiating table, your interests will be ignored. The reality of Exxon’s 2009 carbon tax coming out party is that Exxon needed to defend itself against the Federal Government’s consideration of a cap and trade program. Exxon has stated that if they are to be regulated, then this regulation ought be in a consistent and easily manageable format – a single, centralized national format. Currently, Exxon must delve into regulations of 50 unique, sometimes aggressive, state markets plus the federal level on top of that. This adds significant cost overhead versus a simple one rule system to follow. Additionally, if the federal government decides to make a program to control the CO2 output – it will subvert the actions of more aggressive state legislative pushes like California and Massachusetts. Currently, Massachusetts pays an incentive of greater than $0.20/kWh to those who generate electricity via solar power versus fossil fuels. This eats at Exxon’s profits. If there were a national guideline, politicians in states like Massachusetts and California – who are pushing the rest of the country (and world) – would have less power in the eyes of their electorate to make these challenging judgement calls. I currently prefer the healthy ecosystem of many states arguing to determine the bests path forward with our current system allowing for legislative capture with SuperPacs and the like. It is surprising that Exxon doesn’t support the current legislation, S.2399, as the carbon tax price is far below what Exxon has modeled. Supporting this bill would prime the broader population of the United States to accept a rate that is more than 80% below Exxon’s budgeted price – and it would be until 2036, a full 20 years, that the rate would catch up. The truth of Exxon’s ‘carbon tax’ is not of altruism, but of shrewd business that has little to do with climate change and everything to do with shareholders interests. Exxon’s desire to create market stability and share for itself may help drive a much-needed carbon tax – and if so, let’s take it for a ride. But let us not forget the recent decades of scientific oppression meant to keep shareholders happy at the price of our planet and our health.